This thread will be dedicated to interviews of the members of the site. As we all converse with each other from different parts of the country, it will be great to gain a little insight into peoples experiences and growth as bowhunters and hopefully be imparted by the knowledge that they are willing to share. The thread will constantly updated with new interviews as they come to hand, so we hope you enjoy them. The first cab off the rank for our member interviews will be Neal Dowsett. 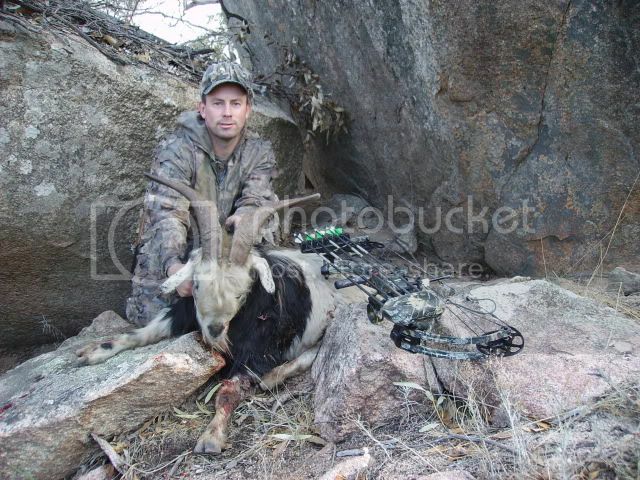 Neal is a long time member who has been doing a fair bit in his area to help bowhunting grow. Enjoy! Where you live: Currently living in Stawell Victoria, by the end of Janurary we will be living in Miners Rest Victoria. Occupation: At the moment i'm finishing off my holiday leave after 25 years as a slaughterman. Favourite Music Has to be 80's music, 80's rock, big hair bands. Little bit about yourself: I'm Married to my beautiful wife Natalie, we have 3 children together and i have an elder son. 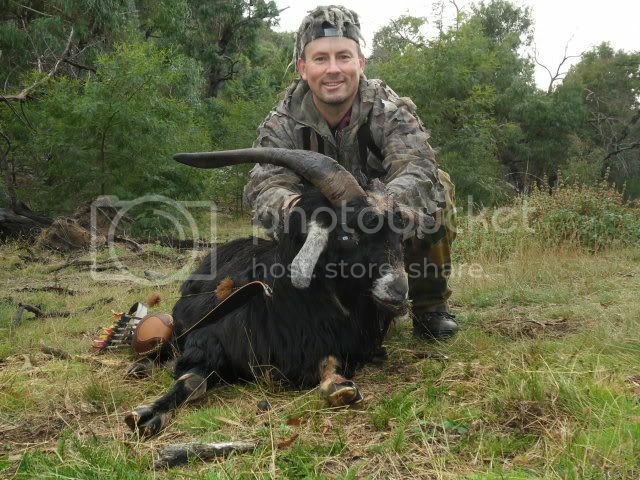 My love of the bush came from my father, after he died when i was 9 my eldest brother Lawrie took over as my roll model teaching me everything he knew about skinning, trapping, fishing and shooting and could he shoot, to this day he would be one of the best shots i've seen in the field, making the shot when it counts. He used a heavy barrelled single shot .22 with open sights, he just didn't miss, it was a pleasure to watch him and think maybe one day i could be like him. 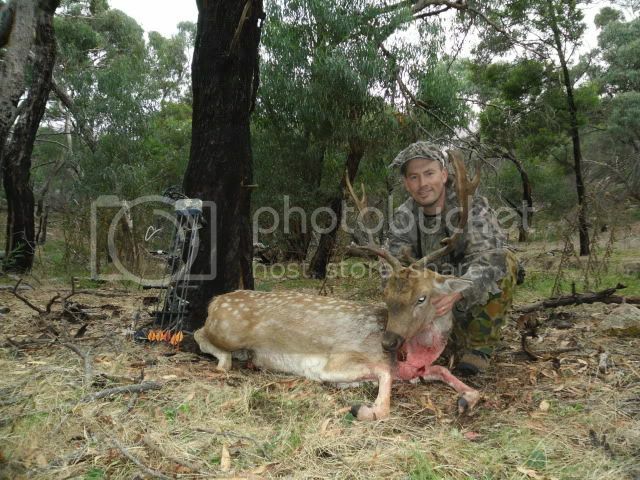 My other interests apart from bowhunting are my family and AFL football, my wife often wonders what comes first. When you started bowhunting: I bought my first bow back in 1987, it cost me a weeks wages. 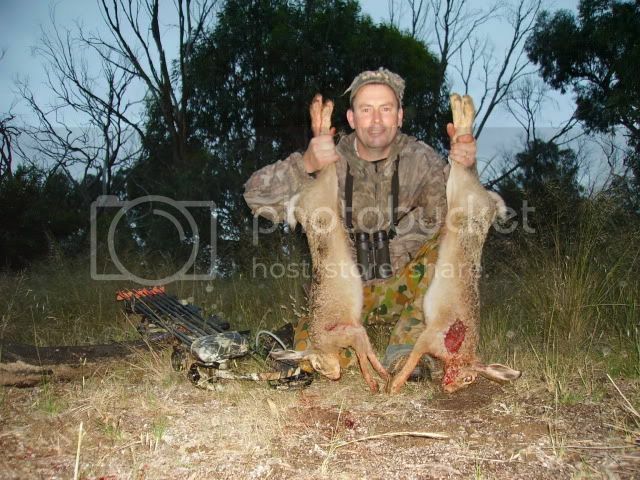 The bowhunting bug really bit in the early 90's when i started hunting with my good mate Tim Brumby. Who has been your main influence? : I would have to say my brother Lawrie who showed me so much when i was just a kid. As far as the bowhunting goes, Tim Brumby has been the one who helped me out when i've needed it. He's great to hunt with and he really enjoys your success as much as you do. 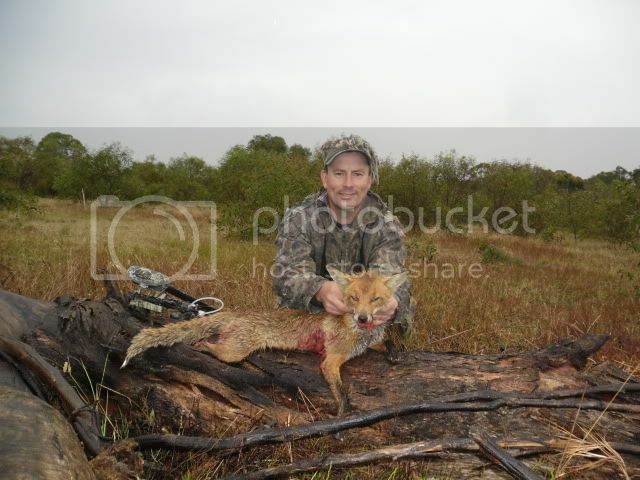 I also enjoy hunting with Owen Phillips and Jerry Redman. First bowhunting success: My first kill was a rabbit with my first shot, i didn't know anything about bows, I had an arrow on the string and another arrow in my back pocket. No nocking point, no arrow rest and no idea. Just got lucky i guess. 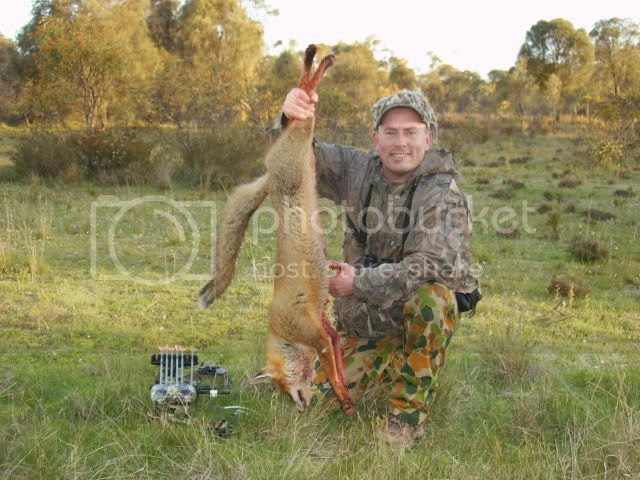 Favourite animal and style to hunt: I love calling in hares and foxes, feels good to know you've just fooled a cagey old fox and managed to get an arrow away before he's figured out whats going on. [Gear that you use: My compound bow is a PSE Vendetta, its a great little bow for me, being such a short arse with a 24&1/2 inch draw length. My recurve bow is a Samick Hunter that i picked up 2nd hand and has given me some great joy giving the traditional side of things a real crack last year. I'm still trying to settle on 1 make of broadhead, i think i've tried all the Aussie heads and still cant figure out which one i like best. Species hunted: Successfully i've hunted rabbits, hares, foxes, cats, goats, pigs and fallow deer. Hopfully i will get the chance to take some of the other deer species we have here in Australia and maybe even a camel and donkey hunt. General view on the future of bowhunting and some tips to share: Be proud of who we are, let people know how good it is to be a bowhunter and don't be scared to tell people they are doing the wrong thing if it effects our sport. Help out new commers to our sport, the more people that get involved the more say we have. 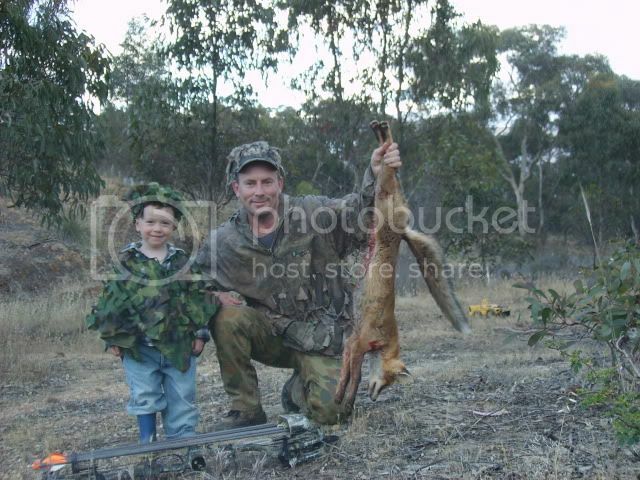 The main thing i'd love to see in the future is my son out taking game with me, hopefully i'll be there when he takes his first animal with the bow. As far as tips go, don't be scared to dream, you never know what tomorrow brings. Hunt hard and have fun. Little bit about yourself: I am about to get married to a great girl after 11 years ... no kids, horses and two dogs . Who has been your main influence? : I still take a lot from the forefathers of the sport ... Hill, Pope, Thompson etc . Their sense of adventure, the way they approached the sport and the fun they seemed to have still resonates with me today. IBO shooter Rod Jenkin's coaching has really helped start to get back to where I want to be . Piggy (Paul Thomson) is fella I really respect ... he keeps it fun, makes me laugh and treats the bush and the creatures that live there with a respect that I really admire . 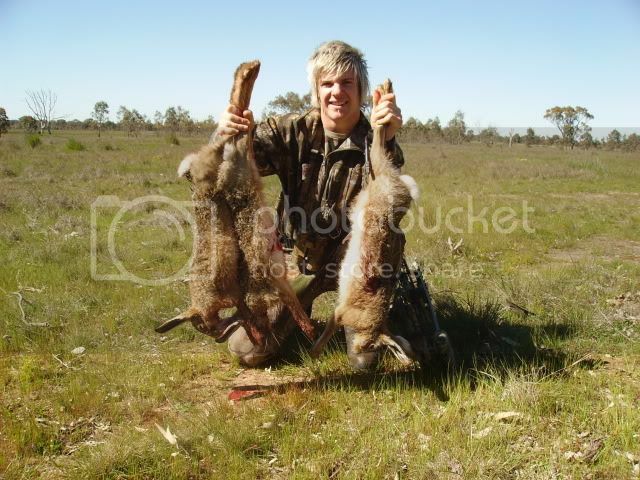 Favourite animal and style to hunt: It will always be Sambar, followed by Rabbits. Sambar live in the places I like being... the countryside they inhabit is truly Gods country. They are such a wily and beautiful animal. I prefer stalking above all else ... it isn't in my nature to 'sit' plus I always want to know what's beyond the next ridgeline. As I get older and my hunting time more limited, I want to see more of what our bush has to offer. But gee Pigs come a really close second! Ahh the tyranny of distance for us Mexicans . Gear that you use: I use all sorts, but have only shot barebow for the last ten years, mainly Hill style longbows in the 55# range. Species hunted: Aside from Buff and Chital, I have had a crack at everything, Reds and Rusa are at the top of my "want" list. 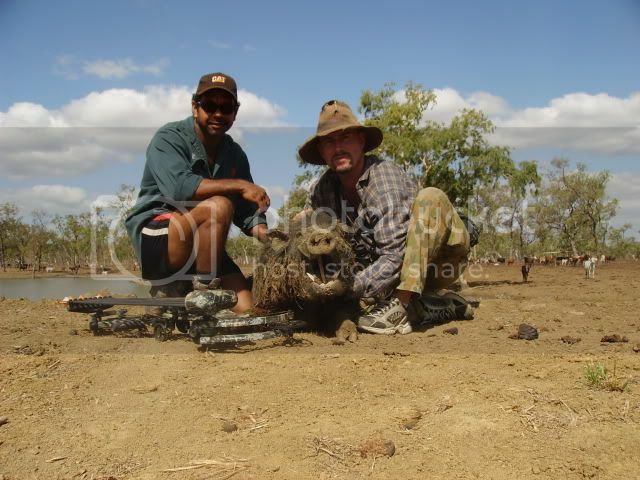 Most memorable hunt: It was south east Queensland. It was absolutely freezing with rain and windstorms, but the pigs were on fire! 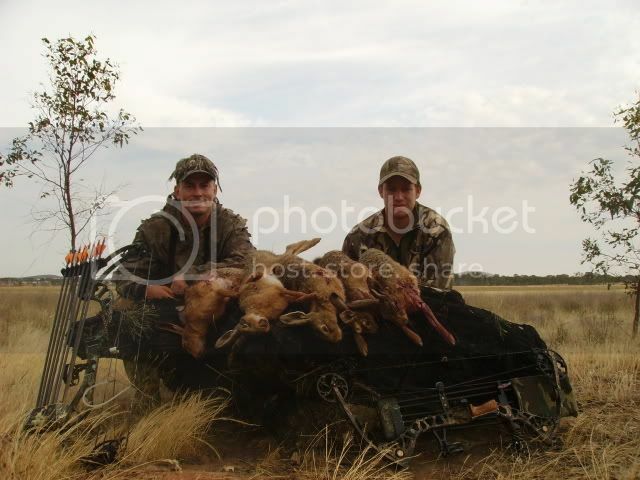 I hunted with a bunch of lads that I have been hunting with for a while ... I hunted in my old red Swanndri. 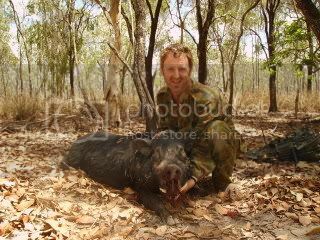 The boys had a good giggle at me as they, camo clad, disappeared into the scrub, but I was shooting better that week than perhaps I have before or since and collected quite a few pigs with some nice tapered cedars arrows I had been saving.There were no great tusks, the goats I took weren't huge, but it seemed that everything went my way that perhaps I was meant to be there that week cleaning up the scrub. It was a great week for sure. I think that the future could be a great one. But we need to keep a watch on ourselves and our hunting partners, mates and fellow hunters. 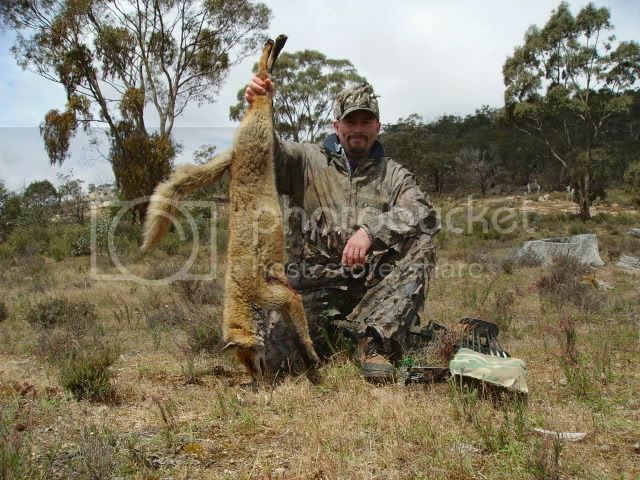 It's a broad spectrum of hunting in Australia and numbers wise, we are an easy target for those who don't understand or like our lifestyle and pastimes. But it is not the anti hunters who will be the end of bowhunting, it will be the culmination of our mistakes, errors of judgement and apathy. It's up to all of us to help introduce others to the sport, acting at all times as a custodian of the wild places and the creatures that live there. Get vocal about the great aspects of our sport, be active about the parts that need improving and be proud of who we are and remember that flinging arrows is above all meant to be fun! 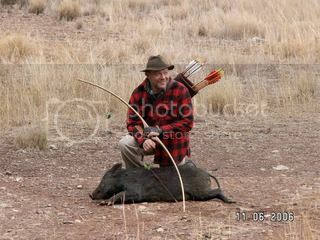 Time in the bush, hunting with a bow and arrow is a privilege that very few people on earth will ever be able to access. We have such a great opportunity ... let's not blow it . And finally ... shoot straight ! A great idea for a thread Antonio. I love getting to know more about people that share my passion for bowhunting. Keep them coming! 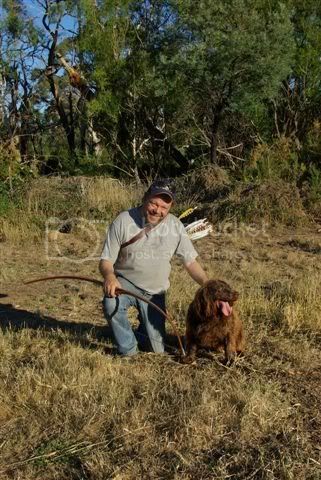 I'm 47 years of age, Lived in Ballarat most of my life, married to my beautiful wife Vicki for the past 22 years, we have two great kids, Olivia (12) & Riley (9) and can't forget the dog, a Cocker-Spaniel called Oscar. Played highest grade Cricket for over 18 seasons, starting to get the Fishing Bug as the kids are starting to show interest. 4WDriving, Camping, Photography, Watching my young bloke play Football. I started off making some really crude bows at around the age of 11-12 and then at around 14-15, one of the local sports stores got in one of those new funny looking compound bows and I was mesmerized by it and had to have it!! I got a paper run and saved like crazy , it took me awhile but I finally scraped up the cash and I was the proud owner of a new Browning "Cobra" 50-60lbs compound bow. My father lit the fire as far as hunting goes, I used to be his gun dog and retrieve his ducks and rabbits, he taught me to shoot, trap & fish. 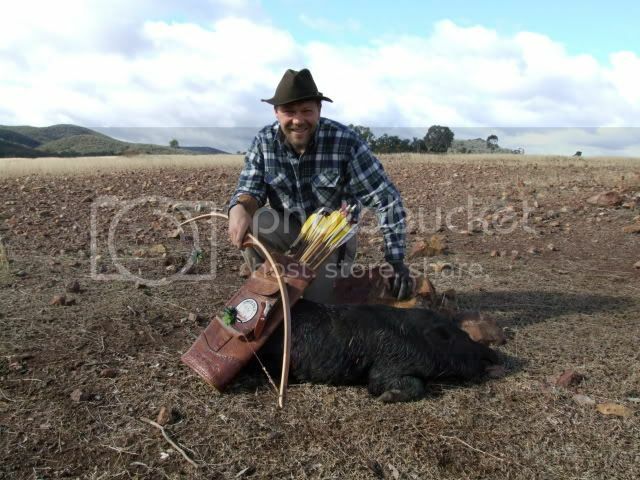 The only problem was he wouldn't go out enough to quench my thirst and I wasn't aloud to have a firearm so that's were the bow came in and with every chance I got I would jump on the push bike with bow in one hand and head for the bush. As far as Bowhunting it would be Ian Fenton, Dallas Conway, Fred Bear & Chuck Adams, I couldn't get enough from these guys and use to inhale as much as I could from their writings and adventures. 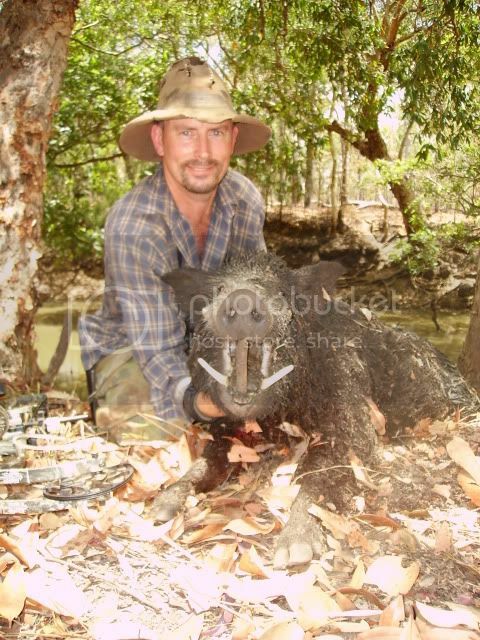 I couldn't wait to get my car license and head to the Macquire Marshes and hunt wild boar like Ian Fenton & Dallas Conway. 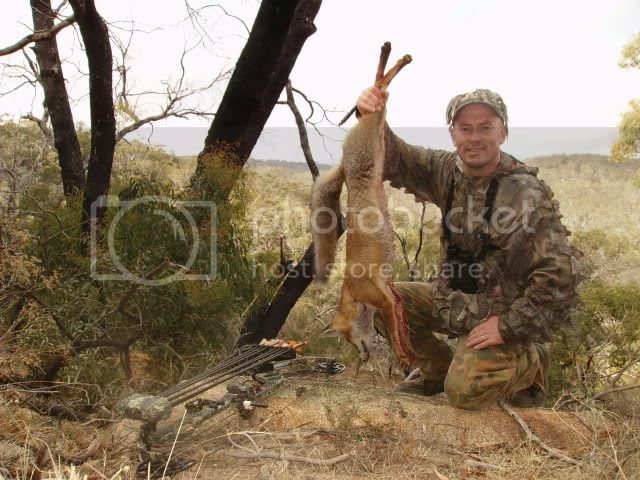 My first real kill was the humble bunny rabbit and it took me years with lots of hit and lost rabbits before I finely got my hands on one with my second bow a Browning "Explorer II". My favourite animal to hunt and is at the top of my list is defintely the Sambar Deer. I luv how hard he is to find and the type of country he calls home. 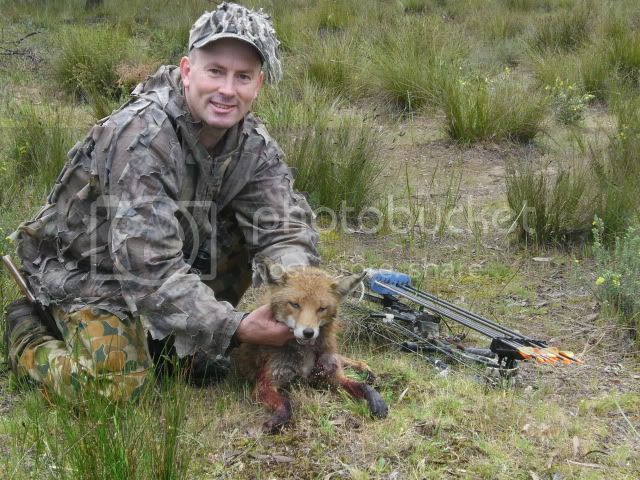 A close second would have to be the Fox, I still get a big buzz about luring in a big old savvy Red Dog with the whistle or better still is to find one curled up asleep and sneeking in and slipping a shaft through him, a real prize I reckon! My favourite style of hunting is defintely Stalking, I luv getting in as close as I can and the challenge that it presents. Rabbit, Hare, Fox, Feral Cat, Dingo, Wild Dog, Pig, Goat, Fallow Deer, Red Deer, Hog Deer, Sambar Deer, Water Buffalo, Donkey, Brumby, Himalayan Tahr, Chamios, N.Z. White-Tail Deer, Turkey. Prong-Horn Antelope, Mule Deer, White-Tail Deer, Elk, Coyote. That's a hard one, so many great hunts over the years for their own particular reasons, some not even taking a targeted animal but because of the whole experience. If had to pick one it would be my Sambar Stag hunt from start to finish, like from first finding his sign, knowing he's there but never seeing him, his ability to avoid me, an aimal the size of a horse and you can't get a glimpse of him for months until finely there he is and it's all worth it. 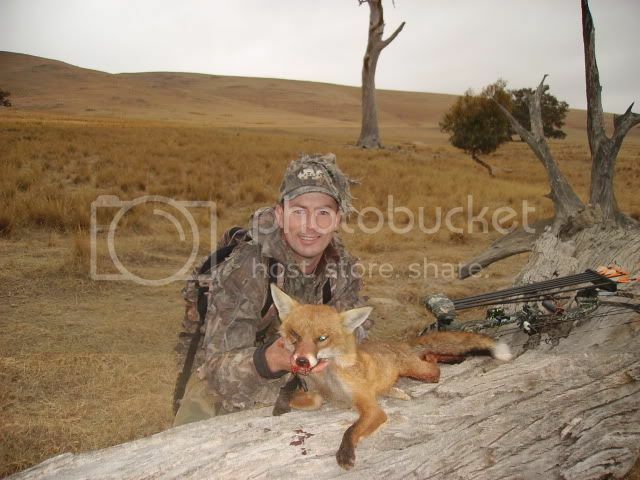 I really do enjoy doing a hunt from start to finish by myself, it has taken alot of years to get to that stage of doing everthing solo and I have gained alot of satisfaction from it. 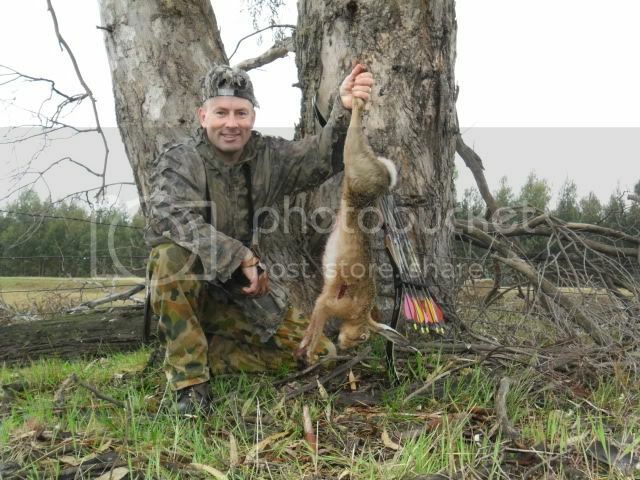 Don't get me wrong I also do enjoy group hunts and have had some rippers with mates over the years and hopefully many more in the future. It's just if I had to pick what I get the most satisfaction out of it would be solo hunting and the hunters that do it would know where I'm coming from. Bowhunting has grown so much here in Oz over the last decade compared to what it was, but having said that and after going over to the Untied States a couple of years ago we are still so far behind them it's not funny. 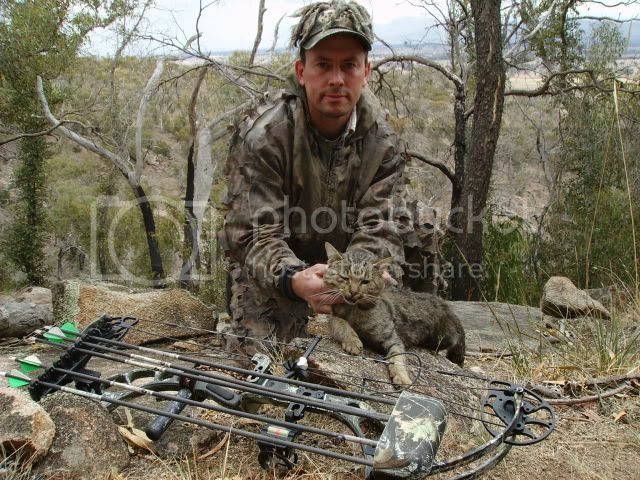 The internet has defintaly been the main driving force for the growth of bowhunting here in Oz, what's available at peoples fingertips now compared to what we had is chalk & cheese, Bowhuntng was like the sub-cult of all sub-cults. It's only been through the hard work and efforts of some dedicated people like Antonio Lara and the crew here on this forum and with the new production of SPB Magazine and some quailty DVD makers that has really bought Aussie Bowhunting to a new level of recognition world wide. converting to the bow, it's onwards and upwards! My tip: Dream Big & Hunt Hard!!! Where you live: Melbourne, sometimes Sydney for work. Little bit about yourself: Mid 40s family man. Other interests outside of bowhunting: Fishing, and the kids. When you started bowhunting: I started bowhunting in about 1982-3.
Who has been your main influence? : In bowhunting: all the early 1980s pioneers (Ted Mitchell Snr, Bill Baker), including the former Victorian Bowhunters Club. In deerhunting: Dwight Shuh, John O Cartier (US outdoors writers), Doug Read, Peter Burke, Mike Harrison (Australian gunhunters), others. First bowhunting success: Between 1982-86, I shot a lot of bunnies. If footage had been taken of me as a teenager shooting bunnies, it would rate as superlative comedy. Favourite animal and style to hunt: I saw my first sambar in about 1984, whilst stalking (read: crashing) through regrowth south of Jamieson. I stopped hunting bunnies and I have only hunted deer, mainly sambar, since that time. Gear that you use: I have two bows, a 2010 Hoyt Carbon Matrix and a 2010 Hoyt Alphamax 35 (both converted from XTR to #5.0 Z3 cams). I shoot Easton aluminium arrows, thick ones in 2317. I currently use Muzzy SS 220 gr broadheads exclusively. Most of the other stuff - quiver, rest, stab and release - is liable to change. Species hunted: Bunnies, fallow and sambar. Mostly sambar. 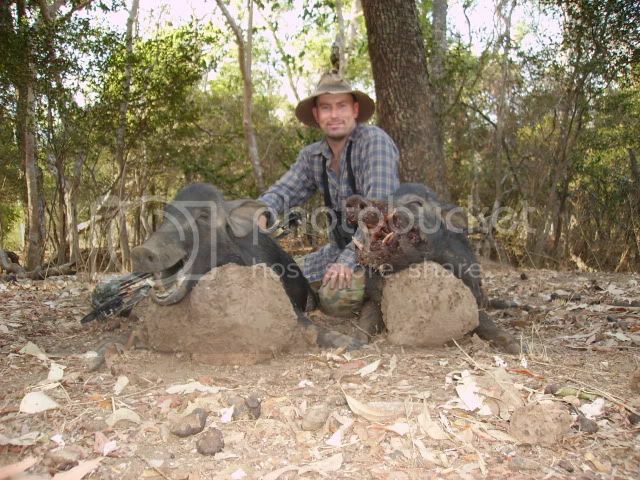 Lots of guys hunt goats and pigs. Given I have limited time, I keep returning for the deer. Most memorable hunt: Lots. Too many to recount in detail. Heavy on the wading through creeks and getting honked by stags and hinds. My first mis-conceived shot at an alert hind taught me more about what it would take to successfully shoot a sambar, though I am still learning. View on the future: I used to have a quite selfish view of hunting. I took the view that hunting with a bow would be banned in my lifetime; and that i was its last ggeneration. So: I kept the fact that I hunted to myself. I would not deny it; but neither did I trumpet it out there. I have decided that if we are to have bowhunters, they would secret, or illegal, or both. Now I have come out. The future of bowhunting is defence. We need to remember lessons of the past: hound hunters in Victoria were under attack by the then Cain government, in the mid 1980s. The government announced a ban of hound hunting, without consultation. The hunters mobilised, and lobbied hard. They overturned the ban, which given the social-democrat government at the time was no small thing. This is a lesson for us. We need to be alert to threats to bowhunting. We should not dismiss our opponents as idiots. They are resourceful, middle class vegetarians whose view of the world necessarily excludes bowhunters. This is the real, identifiable danger. It is something which needs to be identified, and acted upon. I have said it before, but it is worth repeating: we need to look at our place both in the world and amongst hunters. We are a minority (bowhunters) of a minority (archers) - and yet, still further a minority of all hunters. This fact means in a system which credits the majority, we are vulnerable. We can be legislated out of existence (as has effectively occurred in the UK since the 80s, Tasmania in the mid 80s and other locations in more recent times). We need to stand shoulder-to-shoulder with other hunters, in order to get wild deer managed into a sustainable and viable resource by state governments. The best bits of Victoria's game management (such as it is) and NSW's Game Council should be used as a model for the whole nation. We need to resist both the banning of bowhunting and the eradication of wild deer (whether via wholesale slaughter, which is expensive; or by chemical neutering which is ineffective). The archaic view of the pristine bush invaded by ferals, which is the prevailing Game Council view is both wrong and a little mad. The ferals are here to stay, as the bush cannot be turned back in time to where it was in 1788. Tips to share: I have given a lot of info out there, on this site, so i will confine what I say to deer. 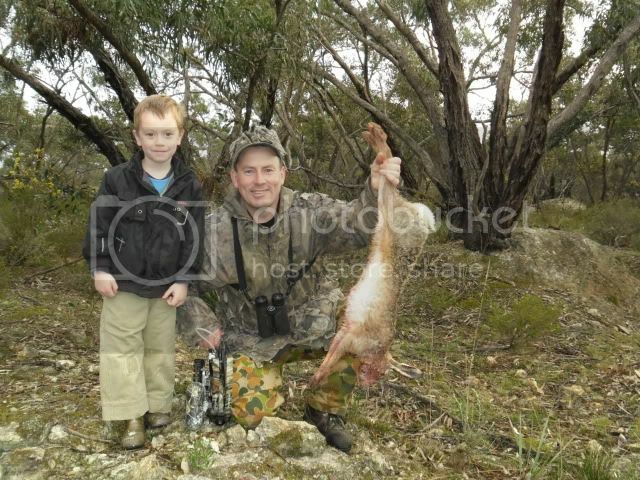 This is a boon time for deerhunters in Australia. If they interest you, take advantage of relatively high historical numbers of deer, to learn about them. Numbers are such that bowhunting these animals was a chore: no more. Until a very few years ago, represented the intermediate to advanced level of bowhunting. 30 years ago it was a big deal to see a sambar; I saw 6 within less than an hour last weekend. Great reads Antonio, cant wait to see the next one! anymore interviewees Antonio? Its great to read what others have done.